HomeNestlé Waters Chaffee County Project: Will Aurora need a change of use from water court to lease water to Nestlé? Nestlé Waters Chaffee County Project: Will Aurora need a change of use from water court to lease water to Nestlé? Greg Baker, manager of public relations for Aurora Water, told the Independent that, in fact, the city is leasing only a small percentage of excess capacity to Nestle and that if a situation arises where Aurora needs the water for its own uses, it can temporarily shut down the Nestle operation. Baker said that Aurora has storage capacity of 155,000 acre-feet of water in various reservoirs, so 200 acre-feet may not matter one way or another to the city. 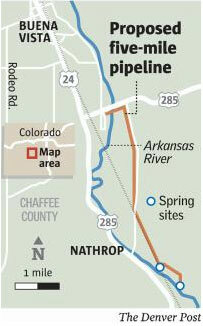 More Nestlé Waters Chaffee County Project coverage here and here.